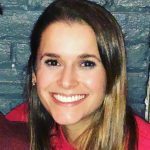 If you couldn’t tell – I love love love breakfast food. Hence my recent posts for Overnight French Toast Casserole, Sausage, Egg, and Cheese Breakfast Casserole, and 21 Make-Ahead Brunch Recipes. I just can’t get enough breakfast food! 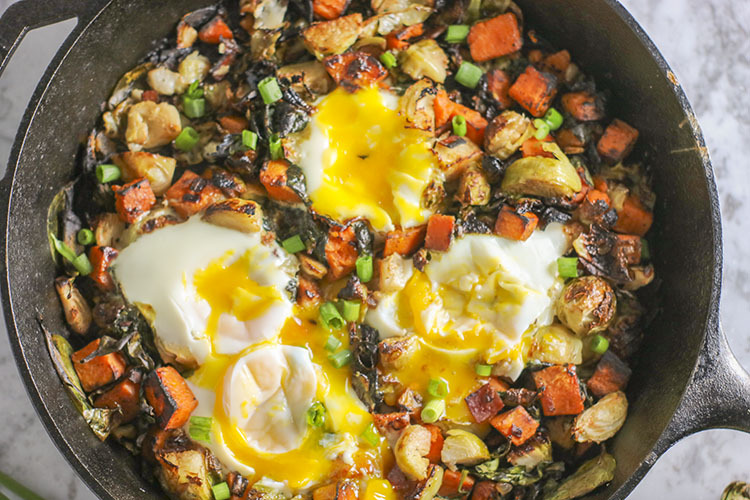 I also have been LOVING my new skillet – one pot/one skillet meals are so easy, fun, and delicious. 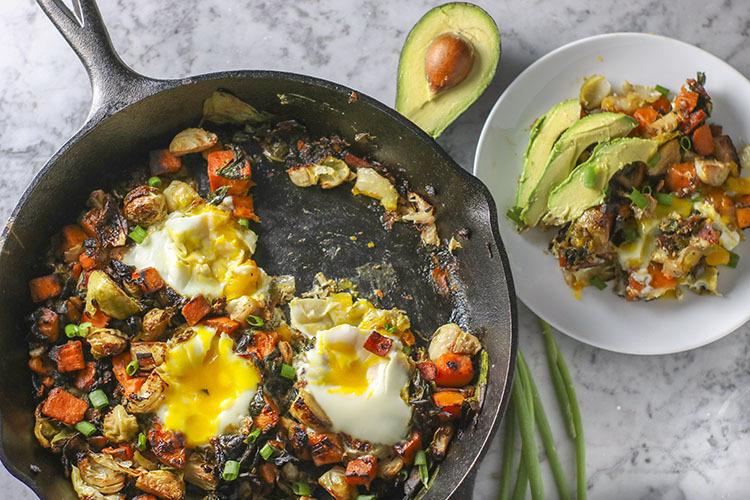 So I decided, why not try and one skillet breakfast? 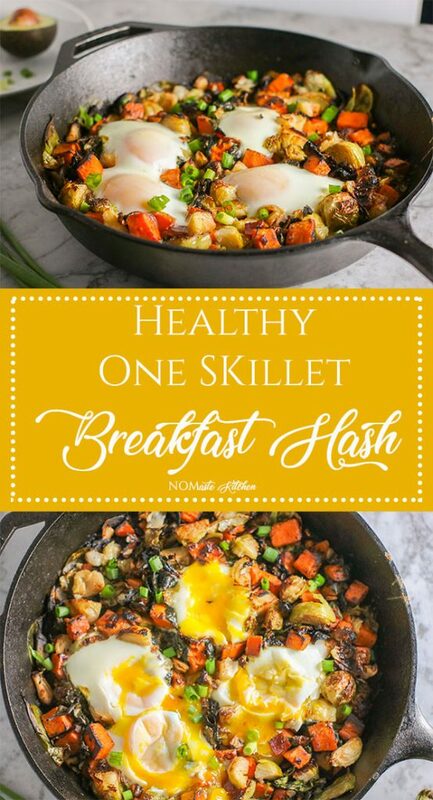 Even better, how about a Healthy One Skillet Breakfast Hash! When I was in college in St. Louis, there was this one INCREDIBLE brunch spot called Half & Half. They had the most amazing fresh-squeezed orange juice and homemade doughnuts. 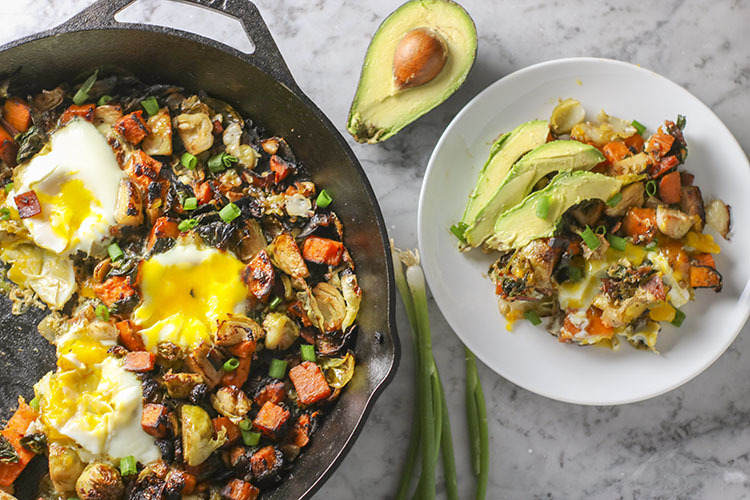 But there was one menu item that was always my favorite – the veggie hash. It came in a small personal sized skillet, filled with roasted brussel sprouts, tender potatoes, seasoned spinach, and caramelized onions. And of course, two sunny side eggs on top. The eggs were still soft when you’d get your food so you could crack them all over the rest of the hash. I would often order mine with a side of ham because – well, I love ham. It added just the right amount of salt, fat, and flavor to perfectly satisfy. Yet, I still felt as though I was being healthier than eating bacon. 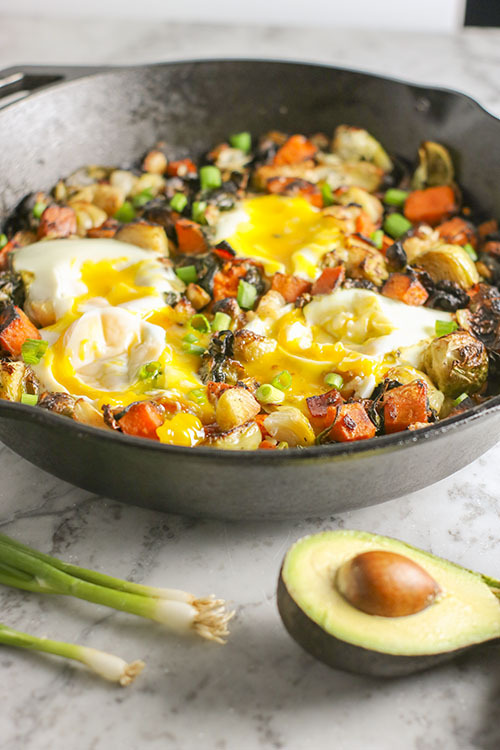 This Healthy One Skillet Breakfast Hash was inspired by the incredible veggie hash from Half and Half – its filled with all the yummy breakfast things you could ever want! Tender sweet potatoes, roasted brussel sprouts, nutrient-rich spinach and salty-delicious Canadian bacon. 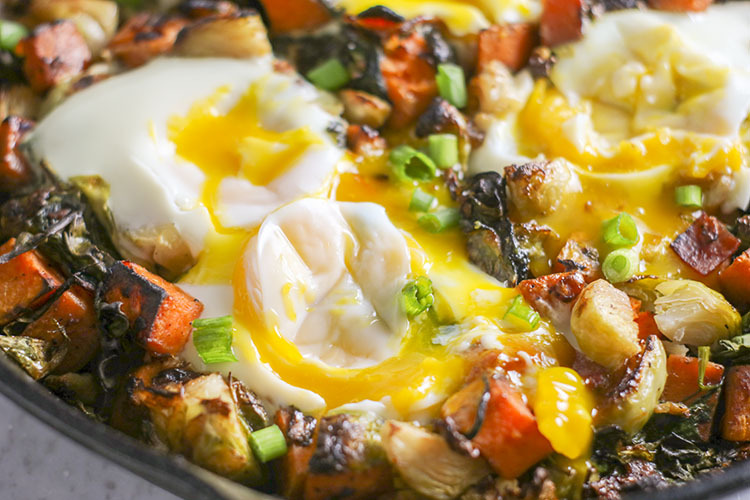 Seasoned with sauteed onions and garlic, then topped with rich, succulent, baked eggs. 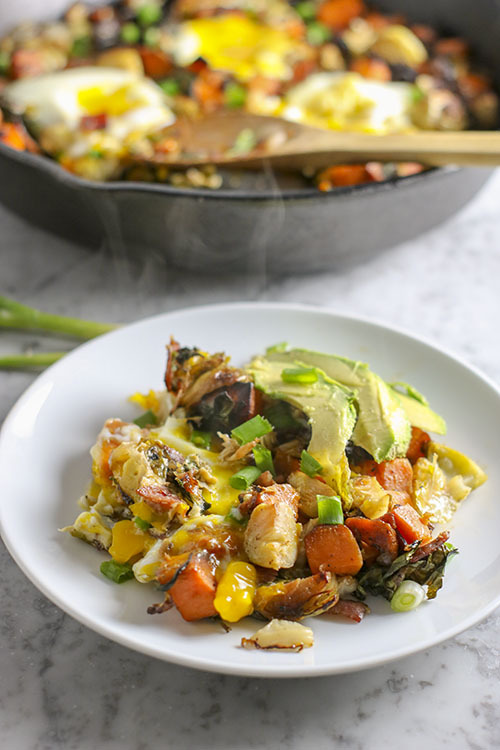 If you are really looking for a treat, pop the egg yolks straight from the oven and let them ooze over the rest of the skillet – then add a few diced green onions and some creamy, sliced avocado – oh BOY! What a treat. 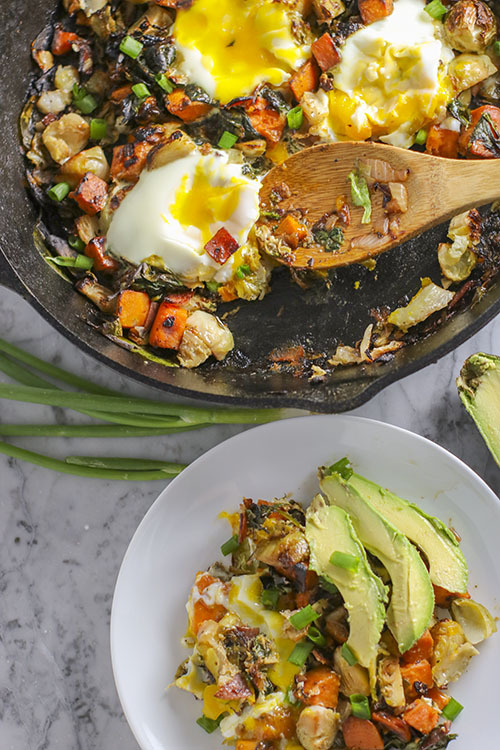 I love one skillet recipes because they are easy to make, even easier to clean and so full of flavor! There is BARELY any seasoning in this recipe and it still tastes amazing. Another great thing about this recipe? You can completely customize it to your liking or taste (just like in my One Skillet Gnocchi recipe). Don’t like sweet potatoes? Swap for regular. Love baby bella mushrooms? Toss those in! Skip the meat and make it vegetarian, or load it up for the meat lover in your family! 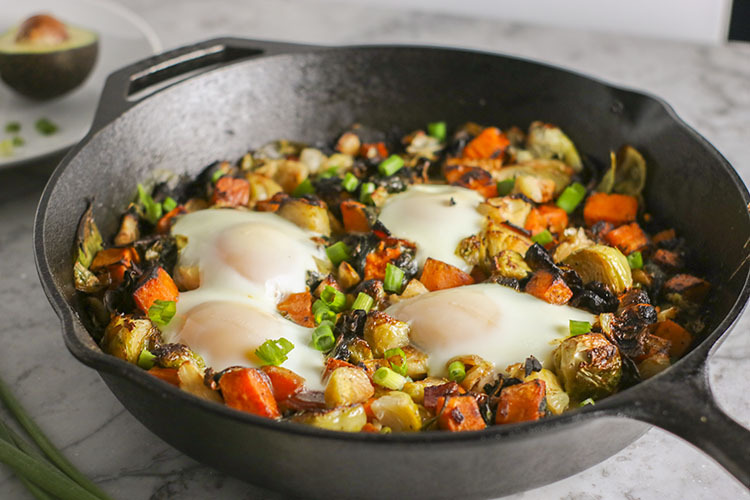 he skillet is yours to fill with whatever delicious flavors you’d like! 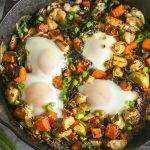 Share this One Skillet Healthy Breakfast Hash with a friend, or save the leftovers for an easy grab n’ go morning meal! 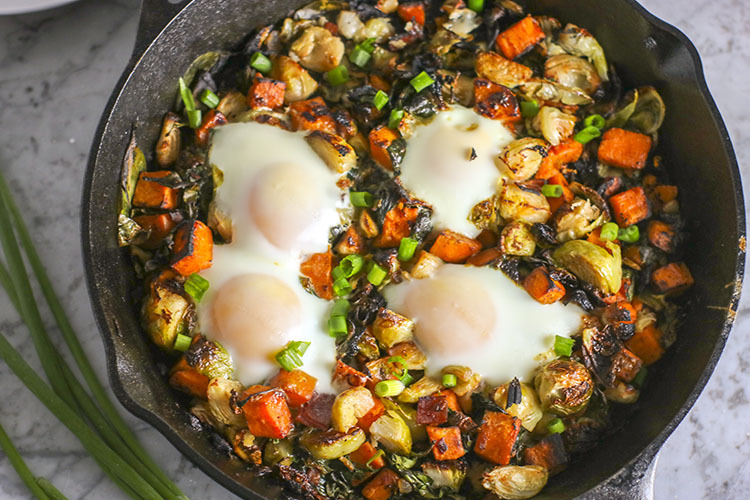 You will LOVE everything about this Healthy One Skillet Breakfast Hash - Tender sweet potatoes, nutrient-rich spinach, and roasted brussel sprouts, sprinkled with flavorful Canadian bacon, and topped with deliciously runny, baked eggs. Add sliced avocado and diced green onions for the perfect final touch! Preheat oven to 400F. In a large skillet, heat olive oil over medium heat. Add onions to skillet and saute for 5-7 minutes until translucent. Add garlic and Canadian bacon to pan and cook for another 1-2 minutes. Add sweet potato and 1/3 cup of chicken broth - cook, stirring occasionally for 8-10 minutes until sweet potatoes begin to soften. Add brussel sprouts, spinach, and additional 1/3 cup of chicken broth - stir to combine all ingredients. Bake at 400F for 25 minutes, or until brussel sprout leaves begin to brown. 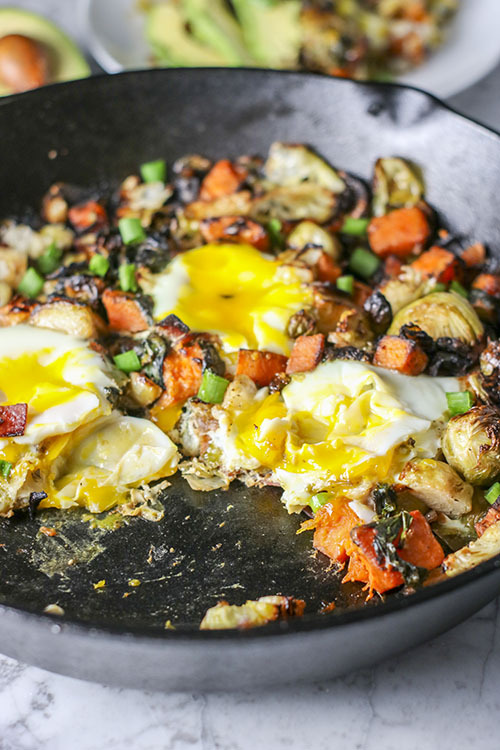 Remove skillet from oven, break eggs one at a time over skillet. Coat with additional salt, pepper, and parmesan cheese, if desired. Broil on high for an additional 3-5 minutes, or until egg white appear white and egg yolks are slightly firm. Storage: Refrigerate in an airtight container - hash without eggs will stay for up to one week. Hash with eggs for 4 days.